If you’re one of the many business owners out there interested in getting into podcasting, then rest assured that you’re headed in the right direction. 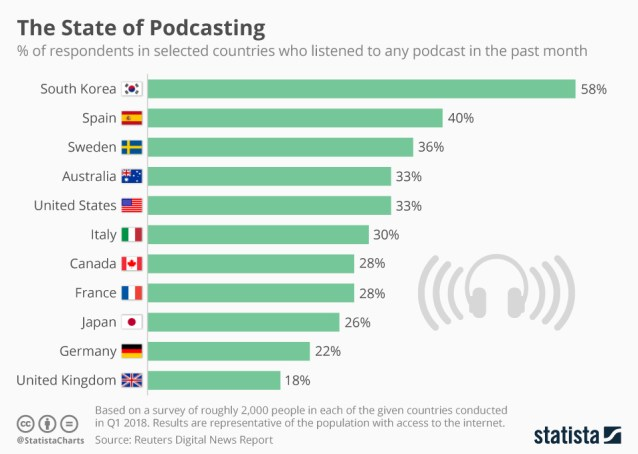 Podcasting is one of the most effective forms of content and has exploded onto the scene with listener stats rapidly increasing year over year. Recent research conducted by Apple found that there are currently over 550,000 podcasts established as of June 2018. This number includes “…over 525,000 active shows and over 18.5 million episodes”, according to Fast Company. There’s pretty much no denying the rising popularity of podcasting — especially for savvy business owners. So, if you’re looking for an article that can give you the scoop on the benefits of podcasting, then you’ve come to the right place. In the following paragraphs we’ll not only discuss various reasons why podcasting can help grow your business, but also provide you with a handful of tips on how to start off on the right foot. Podcasting has steadily grown in popularity with both consumers and businesses for over a decade. The charts don’t lie. If you’re one of the many business owners out there who feel like you may have missed the boat on trends in the past, then podcasting is the perfect option for you, because you’re right on time. 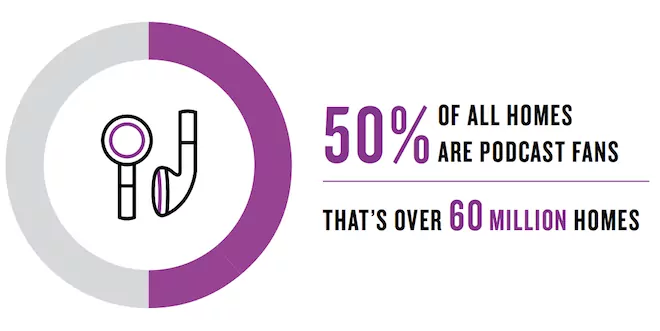 As of 2018, a whopping 50% of all households listen to podcasts. Podcast listening has grown from 15% in 2013 to a whopping 27% in 2017 for men. For women, the stats are even more significant. In 2013 only 9% of women had listened to a podcast in the past month. This number grew to 21% in 2017 — almost tripling. Another interesting fact is that 65% of listeners have been listening for less than three years — which gives a great deal of insight regarding the status of the trend. Furthermore, Bridge Ratings recently predicted that podcast ad spend will grow as much as 30% in 2018. Podcasting, just like other forms of content is an extremely effective way to help you and your business establish authority in your industry. When implemented professionally and properly, podcasting gives you a platform to voice your knowledge, insights and opinion on topics in your industry that matter most. If you’re well-read, in-the-know and have a good amount of quality information to bring to the table, then you’re officially an authority figure. Podcasting tis an excellent tool to help spread awareness of your brand. Whether you’re a budding startup, entrepreneur or an established business, tapping into the listening pool of podcasting is a killer way to help get your brand out there. The key once again, however, is implementation. Consistent, high-quality content delivered to a well-defined target demographic in a niche where you can effectively compete is key. When it comes to content creation, podcasting can be extremely cost-effective in comparison to other forms of content. Writing requires the combination of both ability and time to create high-quality content, and with long-form content proving to be most effective, many entrepreneurs can quickly find themselves burned out. Hiring a writer to turn around high-quality industry-specific content can also be a difficult endeavor for entrepreneurs and businesses facing a more limited budget. Vlogging also presents problems for those less-tech savvy entrepreneurs or businesses on a limited budget. If you want to stand out and be effective with your vlogging, you’re going to need a quality camera, accessories, editing software and a decent camera and lights setup. Furthermore, handling edits can be extremely time consuming and outsourcing just adds to the cost of production. Then, once it’s all said and done — where are you going to put your setup? If you’re a home-based business owner, you’ll need to dedicate an entire room to this process when it’s all said and done or have the ability to rent studio space. Podcasting on the other hand, in comparison is much more cost-effective. All you need is a good microphone and audio editing software such as Audacity to start. 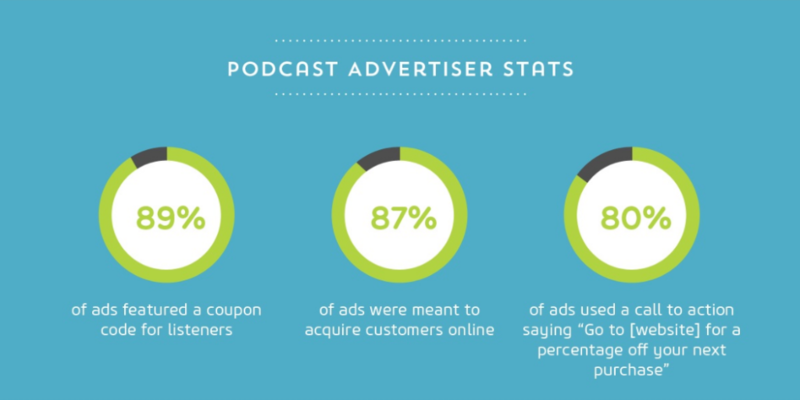 Even better is the fact that podcast listeners tend to be an extremely loyal demographic. According to recent research by Nielsen in the first quarter of 2018, 16 million individuals in the United States alone identify as “avid podcast fans”, with 80% of listeners listening to either most of or all of their podcast episodes in full. Furthermore, these listeners also listen to an average of 7 shows per week. Finally, podcasting can help boost business growth largely in part due to the fact that many of the listeners are an ideal pool of consumers to target for business purposes. 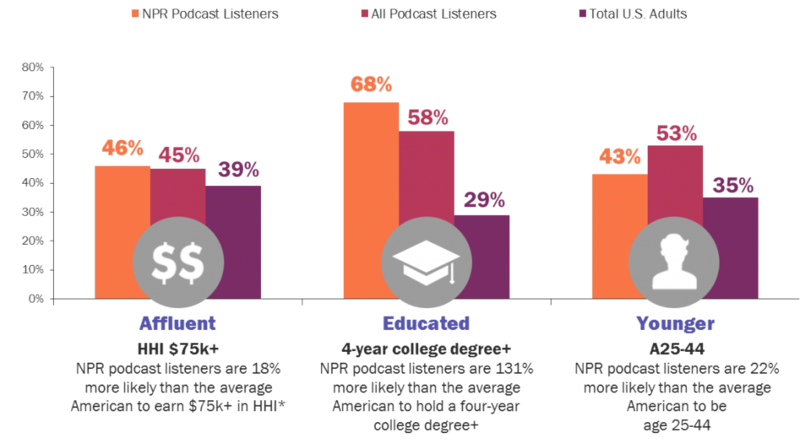 The listening demographic is split almost down the middle with 56% of podcast listeners being male and 44% being female and an insane 45% of monthly podcast listeners report a household income over $75k. This is 10% higher than the general population. So, you’ve been made aware of the numerous reasons why podcasting is a great tool to use to help grow your business, so now what? 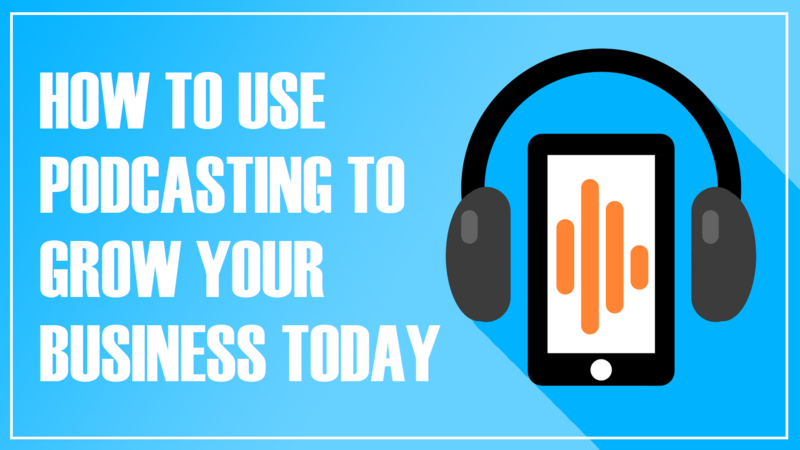 Well, we’ve included a quick and snappy little guide to help get you started on the right food if you’re considering using podcasting to boost business growth. What are you looking to accomplish with your podcast? Is your primary objective to build your email list? Is it to establish and build your brand or spread awareness? Define your target goals and then proceed to set up periodic milestones to help keep you on track. How many listeners are you looking to pull in a month? How quickly are you looking to grow and what numbers are you looking to achieve by what date? Defining and documenting a well-thought out strategy and constantly reviewing and tweaking it is absolutely imperative for success. We can’t emphasize the importance of defining your niche enough. The biggest mistake you can make when it comes to podcasting is jumping in headfirst without doing and market research. What industry are you currently in? What is your competition? A simple Google search can quickly answer this for you. What about your target demographic? The more detail you give to this the better. For example, identifying your target as millennial women, is going to be significantly less effective than a target demographic of, let’s say, millennial women with children and household incomes of $50K or greater. Your consumer pool may decrease with specificity, but it’s important not be afraid of this as the more specific you become, the more your marketing strategy increases in effectiveness. Finally, what’s your USP? What are you going to do differently with your podcast that others arent? For example, John Lee Dumas of Entrepreneurs On Fire decided to position himself in his industry as one of the only podcasters in the business pumping out podcasting episodes on a daily basis. It’s pretty intense, but he’s been extremely successful with this strategy. Creating a schedule and sticking to it is going to be of paramount importance as well. If you’re going to go through all of the trouble to start up a podcast and then follow through with delivering content on an inconsistent basis, then you’re going to fail — point blank. You need to instill trust in your listeners and a large part of the job is simply just showing up when you say you will. In the television industry series are often filmed months in advance of their air date and podcasters should take a page out of their handbook when it comes to recording. Whether you’re recording a week’s worth of episodes, three month’s worth of episodes or an entire series in advance, just do it. Trust us — you’ll thank yourself in the end. So maybe you decide you want to release a weekly podcast. An effective option to take in order to get on top of your recording schedule is to film perhaps two to three podcasts a week, while only releasing one. This helps keep the process smooth and efficient and will help you immensely when it comes to the inevitable crises that will pop up from time to time. This is extremely important advice, especially for all you loner, rebel entrepreneurs out there. We’re not telling you that you can’t do it alone — but why the heck would you want to? Collaborating is efficient, effective, helps build your professional network and helps establish credibility. Plus, when you collaborate with like minded individuals, you’re able to leverage their audiences as well. It’s a win-win. So whether you’re a guest on someone else’s podcast, or you bring guests onto your own, collaborate with those around you. There are tons of ways to monetize your podcast — all it takes is a little bit of research and some good old fashioned hard work. Selling sponsorships is probably the most popular method and with ad revenue increasing as much as 30% in 2018 alone, sponsorships present an awesome opportunity for podcast monetization. So get your email pitch together and start scouting businesses. Pricing is typically done in CPM (costs per mille) manner. This means that industry rates are calculated based on how many thousand listeners you can guarantee the advertiser that you’ll be able to pull in at the 6 week mark. Other options are CPA (cost per acquisition — the cost of acquiring one new customer), or just a flat out “Name Your Own Price” strategy. When it comes to advertising, it generally works best when it’s baked into your content. So if you’re covering a topic related to an advertiser, this is the ideal way to do it. Negotiating with your advertisers is key to ensure statisfaction and longevity, but many professionals structure their advertising by offering both a pre-roll and a mid-roll. John Lee Dumas for example recommends offering a 15-second pre-roll at $18/1000 listens (where you roll off information about your sponsors in the beginning of your episode) and a 60-second mid-roll at $25/1000 listens (dropping sponsor information mid-way through the podcast episode). At this amount, if you could pull in 10,000 listeners by the 6 week mark for your episode, you would pocket $180 for the pre-roll and $250 for the mid-roll, bringing in a total of $430 for the combination. Add another sponsor and you’ve just doubled your income to $860. Release 4 episodes a month and you’re raking in $3,440. Cha-ching! Keep in mind that sponsoring is nowhere near the only way. There are dozens more ways in which you can monetize your podcast and all it takes is some research and creativity. For example, you could also use your podcast to build your email list and sell products such as apps and books, courses and even business services. So there you have it! All of the amazing reasons why you as a business owner should definitely be considering harnessing the power of podcasting for your business. With podcasting, you have the ability to help spread awareness, establish yourself as an industry authority, build your brand and tap into an insanely loyal and lucrative pool of consumers in an extremely cost-effective manner. The numbers don’t lie — and with consistent year-over-year growth for the past decade, now is the perfect time for you to dive in headfirst into what can quite possibly be your most lucrative endeavor yet. U So what are you waiting for? Have you started a podcast in the past or are you currently running your very own podcast to help boost your business? If so, leave a comment below for some first-hand insight! We’d love to hear from you!